O’More College of Design and Kingsport, Tennessee-based Eastman are partnering this spring to promote the application of an environmentally friendly fiber in original, ready-to-wear knit clothing. O’More sophomore Breonna Walker (top) shares her preliminary sketches with Eastman’s Market Development Manager Terry Lawler. In the Eastman Naia™ Challenge, students in O’More’s Fashion program (the only program from Tennessee to be recognized among the Top 10 in the South by fashion-schools.org) will create fashion-forward garments using fabric composed of Naia™, a cellulosic yarn made from wood pulp and derived exclusively from sustainably managed and certified forests. The Challenge began on Feb. 16 with students presenting their preliminary sketches to Eastman Market Development Manager Terry Lawler and Marketing Communications Representative Meghana Diwanji. The collaborative effort led O’More sophomore Chloe Baur to propose designs inspired by royal court portraits of the widowed Queen Victoria. A portrait by Henrich Von Angeli caught her eye that emphasized the arms and neck. Baur’s design proposal takes into consideration the breathability, wrinkle recovery and drapeability of fabric produced with the Naia™ fiber. Stevenson seeks to push-the-needle in the Challenge by exploiting the limitless opportunities afforded by fabric produced with Naia™ fiber. 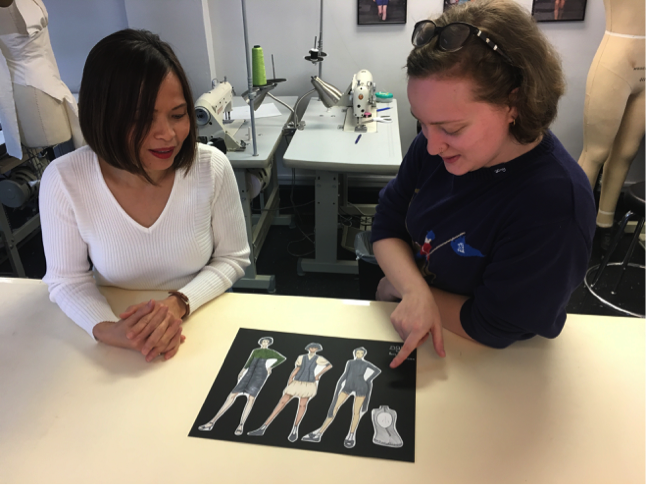 Designs will be juried by Eastman representatives, O’More faculty and industry professionals, and showcased at the 2018 O’More College Fashion Show on May 10 at the Franklin Theatre in downtown Franklin. Students will be judged on versatility, comfort, innovative cuts, use of surprise elements with hardware, trims and functional embellishments. Introduced at the Interfilière Paris fair in January 2017, Naia™ is a poised, new reflection of a long-standing fiber that enables luxurious, comfortable and easy-to-care-for fabrics and garments. This marks the second year that O’More has collaborated with Eastman, a Fortune 500 company, to promote the versatile and environmentally friendly fiber. Last year’s Naia™ Design Challenge featured evening and formal wear. More information as well as updates on the Eastman Naia™ Design Challenge are available online at OMoreCollege.edu.